"The Beatles' sixth studio album Rubber Soul is arguably the best album of all time, though some may argue it’s not even the best album The Beatles made. The album came after their exposure to Bob Dylan and pot. It was only their second album to contain completely original songs. The lyrical content on the album is markedly more sophisticated than their previous material. The name “Rubber Soul” is a pun on soul music and a shoe’s rubber sole. Paul once heard a critic describe the Rolling Stones as “good, but really ‘plastic soul’, and decided to change up the expression to create the new title. Their transition from most popular band to best band of all time began with a string of albums that may never be matched again" (Genius). The album opens with "Drive My Car." A classic Paul Beatles song. As I mentioned previously, I especially love the version on the LOVE album where it's mixed with "What You're Doing" and "The Word." Never was a huge fan of this song by itself, but I do appreciate it in the concert setting. Paul delivers the song very well, and the crowd loves it. The second track, "Norwegian Wood (This Bird Has Flown)," is one of my favorites on this album hands down. I always loved it since I first heard it and John's absolute vulnerability and poetic way of expressing being curved by a woman is really something. It's also just a very peaceful song. "You Won't See Me" is one that I really got into recently after seeing Paul do it at a lot of shows. I think it's a funny concept for a song. It's essentially Paul getting curved right after John on the song prior. Who the hell is curving these guys? "Nowhere Man" is another mellow one that I love. John's singing is perfect and he's definitely channeling his inner Dylan on this one as well. "Isn't he a bit like you and me?" George is up next. "Think For Yourself" is a great tune that shows George "thinking for himself." It shows George's ability as a writer and promise for more greatness. "The Word" is one of the more upbeat songs on the album--it's all about love. "Fun trivia: after finishing this song, Lennon and McCartney got incredibly high and scrawled the lyrics to this song on a large sheet of paper to celebrate" (Genius). The next song is one that I do not care for at all...sadly. "Michelle" is just not the song for me. It's a bit too slow and dreary. I could maybe learn to love it sometime, but I haven't given it the chance yet. "What Goes On" is one that I saw Ringo perform in Atlanta. I ... hate this song. It's so country. It's the only "Lennon-McCartney-Starkey" song, ever. Yeah. Oh I love this one. "Girl" is such a perfect song. Again, about loss and Lennon's vulnerability. I love the cover of it in the film Across the Universe. It's so beautiful. Watch the clip here. This may be my favorite song on the album. The version here, is quite chilling. "I'm Looking Through You" is the tenth song on the album. It's another one that has actual substance, not just the "she loves you yeah yeah yeah" type stuff. I really like this song. I think Paul's vocals are perfect and the song is, sonically, very interesting. I also think everyone can probably relate to this song. "In My Life" is such a beautiful song by Lennon. It's a perfect song. So sweet and so sentimental. "Wait" comes next. It's not a song that I ever really got into, but it's not the worst on the album in my opinion. John leads the song. The next song is another by George. "If I Needed Someone" is a George classic. I remember in his autobiography (which is amazing by the way if you are at all interested, I would recommend it) he wrote about the song, and I found the quote. It’s like a million other songs written around the D chord. If you move your finger around you get various little melodies. That guitar line, or variations on it, is found in many a song and it amazes me that people still find permutations of the same notes." 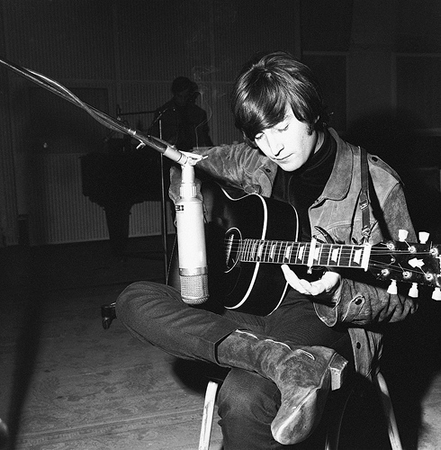 The last and final song on the album is a great one by Lennon. "Run For Your Life" is full of great lyrics. Some of my favorite, "well you know that I'm a wicked guy; I was born with a jealous mind." I love this album so much. Aside from a few songs, "What Goes On" in particular, it's damn near perfect. I love the more reflective and introspective lyricism we are getting from John on this record. The Beatles are truly mastering their craft here and it's only going to get better.